Agent can Email a chat transcript immediately when agent is in interaction with the customer on an ongoing chat. Under the setting option of the Top-left side corner of the chat, Click on “Mail Transcript” as per above image. Agent will receive an pop-up to enter Email id where chat transcript is to be send.Enter the Email ID and just click on OK.
Chat transcripts can be sent to designated emails either automatically or manually as needed, such as for follow-ups or case sharing. You can also send a chat transcript to the visitor you chatted with upon request. 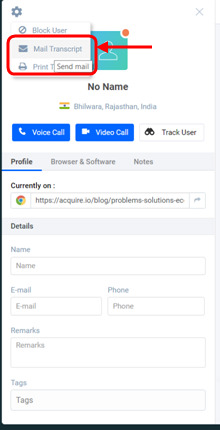 Once you click on Mail Transcript below dialog box will appear and you just have to put the email id of the recipient so that he can receive the same chat transcript. There is one more way of sending the chat transcript and that is automatically send the chat transcript to your email after the chat ends.